Adrenaline fueled roleplaying title, Tales of Thorn: Global, with the introduction of the first in-game Big Event. Players can join the Big Event until Sunday (July 22th UTC) for a chance to obtain unique items, score points and climb global leaderboards. The Big Event has already proven to be a success and is planned to appear in the game regularly. Since the launch in the Western markets, Tales of Thorn has already received over 150,000 downloads and has secured a place on the “New Recommendations” list on the App Store in Europe. A localised version of the game for Russian market will be released tomorrow (July 20th), while the German version is in development and planned to launch later this summer. 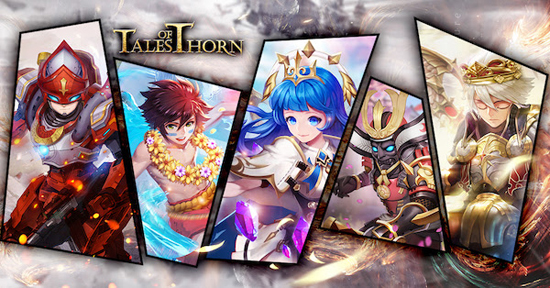 ARPG Tales of Thorn: Global features advanced character progression, offering customization and a target lock-free combat system that allows players to combine their weapons to unleash powerful combos. Gamers can immerse themselves in the robust PvE single player mode or choose from a number of multiplayer options, such as Tower of Honor (3v3), The Hunt (2 players) or Boss Trail (4 players). For cross-server arena battle fans, Tales of Thorn provides a unique and innovative PvP experience in a balanced arena system where both high and low-level players are recalibrated to even the playing field. While massive gear loots enable players to equip their character with numerous weapons and cosmetic items, the multiplayer modes in Tales of Thorn really come down to control skills and combat strategies.